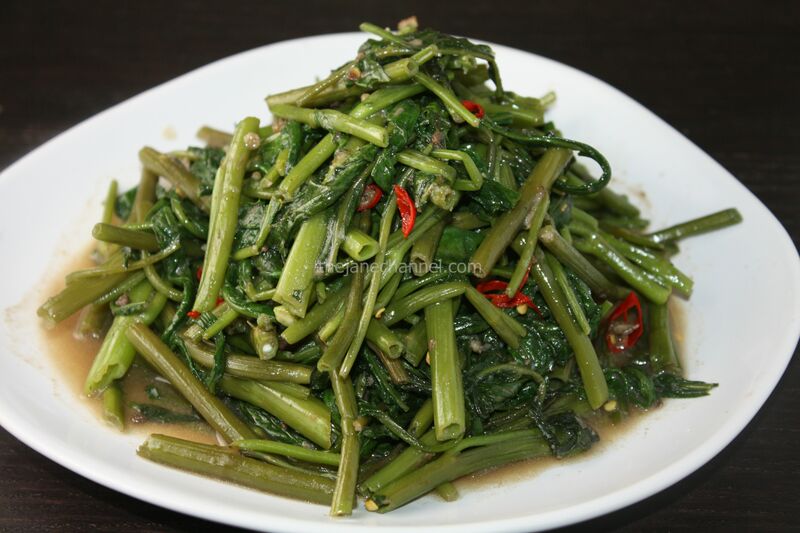 Water Spinach also known as ong choy, swamp cabbage, swamp spinach and kangkong. Belacan is Malaysian shrimp paste that comes in a block. Combine the two, and you’ve got a classic Malaysian dish that highlights the characteristics of Malaysian food – strong flavors and vibrant colors. Wash and trim the water spinach, remove the base stalks (about 1 inch). Cut into 2-3″ sections. Blanch water spinach in large pot of boiling water for 30 seconds. Drain and set aside. Heat oil in skillet over high heat. Add garlic, chili, and belacan, stir until fragrant. Add the blanched water spinach, mix well with the garlic, chili and belacan. Cook for 1 minute or until soft.